The exhibition titled Cosmopolitan Jungle will remain open until December 13 of this year at the Museo de Arte of the Universidad Nacional de Colombia. With this proposal, María Belén Saéz, curator of the exhibition, aims at promoting dialog and collective creation. The exhibition opened during the month of May of 2014. 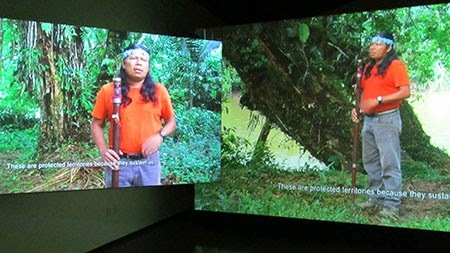 A commissioned proposal, it included the participation of artists Fabián Moreno and Abel Rodríguez—two artists well versed in traditional botanical knowledge—Ursula Biemann and Paulo Tavares; Miler Lagos, Delcy Morelos and Miguel Ángel Rojas; along with a group of shamans that contributed to the project. It contains sound archives from the rainforest and magical shamanistic rituals from the Amazons that serve to generate and intercultural experience based on the interaction between several artworks associated with nature and the culture of the Amazon basin: installations, sculptures, videos, sound archives, drawings and painting.